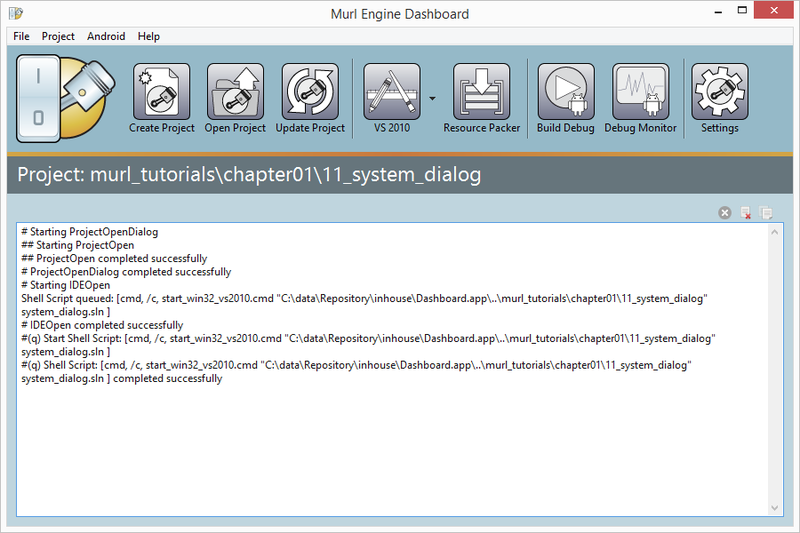 Since build version 1.00.3970Beta a first version of the Murl Engine tool "Dashboard" is provided. The Dashboard is a tool to simplify the process of creating and maintaining project files across different platforms and provides some further helpful functions. The command new project can be used to create a new Murl Engine project with the familiar directory structure and with project files for all supported platforms. By using open IDE you can open the project in your favored IDE and immediately start your development. If desired you can also directly start the Resource Packer tool to create resource packages from all the resource files in the individual *.murlres directories. The update project feature updates all project files (Visual Studio 2008, Visual Studio 2010, Xcode iOS, Xcode OSX, Android ...) by automatically adding new source files and removing not existing ones. The Android build command offers a fast and convenient method to create and test a Android build. After the build has finished, the final App will be automatically installed and started on a connected Android device. The creation of a signing key for release builds is also supported. The tool can be found in the directory Dashboard.app in the Murl Engine package. A separate installation is not necessary. The only prerequisite is an installed Java runtime environment. Further information can be found in the section Dashboard in the User's Guide documentation.